Some days, you just feel like a blah. A big, beige blah. Like a potato with feet. And some days we can’t even explain why we feel that way. And other days, the world conspires against us to create said blahdom. It just happens. So we can all relate to the little boy in Jack Kent’s The Blah. His older brother stepped on his crayons. His mom is too busy doing mom stuff. (What? That happens?) And he feels like no one listens at all. So he creates the King of the Blahs – a drawing of a big blotch with a crown who terrorizes his fellow blahs. In this simple little story (which I first read almost 30 years ago), Jack Kent perfectly captures the frustrations of being a kid. Like when I was seven and I wanted my mom to listen to this great joke I’d made up (it involved a snowflake and a burrito if I remember correctly) and she was on the phone and couldn’t listen. Or when I’d recorded a soap opera called “As the Stomach Turns” on my hand-held tape player and wanted my grandmother to have a quick listen and she happened to be talking to her neighbor Abe, who strangely wore bathrobes all day long. And I wanted to turn right around and draw my own King of the Blahs on the wall of my room. 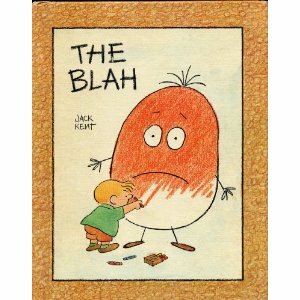 Published in 1970, The Blah is as relevant today as it was then – for kids and adults. It’s a great book to bring out when the blahs are at your house for no other reason that perhaps they were bored down there in Blahville. There are just some days like that. And if, on some day in the future, I slightly resemble a potato with feet, you’ll know why.